Tommy’s speech, providing a carer’s perspective, on the theme of “No – one ever asked ” highlighted the transformational impact that listening, kindness and understanding made to his journey as a carer, and the importance of looking beyond a person’s diagnosis to engage with them as an individual. If you would like to access further information about the Collaborative and to view presentations from the latest learning session, please click here. The following film has been developed on behalf of the CNO Office, England in collaboration with DCV campaign featuring Tommy Whitelaw. The NHS Greater Glasgow & Clyde's Patients' Stories Library for Hospital Staff aims to use patients’ and carers’ experiences to look at how acute services can be improved. Dementia Carer Voices where proud to tour with Healthwatch across Essex back in October 2015. You can view the blog post and pledges from the few days here. Thanks to every one of you who attended each event and the @HWEssex team for arranging the few days. Below is a new film about the tour with some of the Nurses who attended sharing their pledges made to the Make a Difference Campaign each day. Tommy recently spoke to our inspection team to talk about his experiences of caring for his mum Joan Whitelaw, who died last year after living with dementia for several years. He spoke about the difficulties he had getting the right services for his mum at the right time and how this led him to take his dementia awareness campaign "On Tour"
To mark National Dementia Awareness Week which runs from 18 to 24 May, NHS Employers the Nursing Times are working with the Alzheimer’s Society to promote resources available to NHS organisations and the NHS workforce. As part of this activity, they have specially commissioned a short video of an interview with Dementia Carer Voices’ very own Tommy Whitelaw. You can click on the image Below to preview the trailer for a longer film which will be launched on 12th December in NHS Ayrshire and Arran University Hospital Ayr lecture theatre. 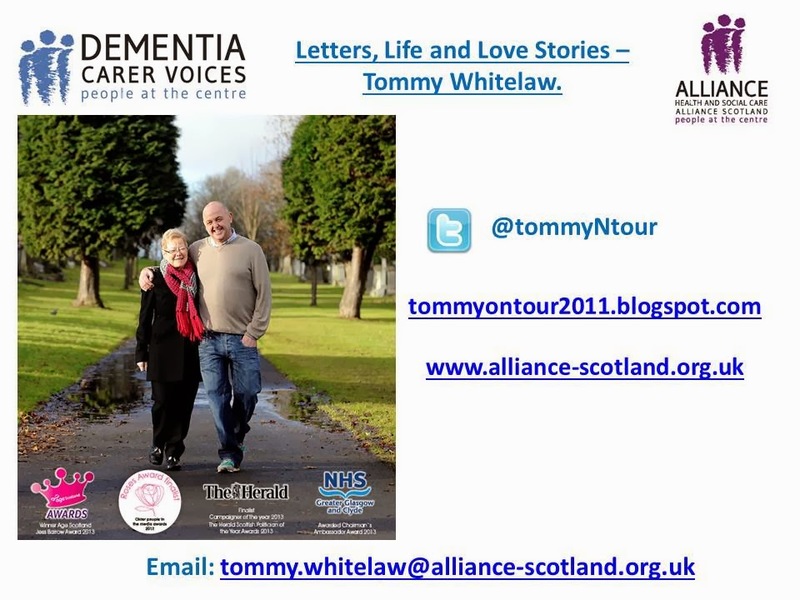 This film (This link will take you away from our website) features the ALLIANCE’s Dementia Carer Voices UK Lead, Tommy Whitelaw. Tommy shares stories about his caring journey for his mum, Joan. This included the ups and downs they faced on a day to day basis and how some situations could have been made easier for everyone if they had included Tommy, his mums primary carer, in the conversation about his mums health and care support. You truly are an inspirational son! It strikes my heart to know that you were able to care for your mum during her time. I wish we have more people like you. I was moved by everything you said ! I have come to realise the importance of 'Love'. Thank you so much for talking at the University of Bedfordshire conference! your story was incredible and so heart breaking yet so inspirational! you've made it hit home just how much of a difference people can make to other lives. you truly are an amazing man! my heart to know that you were able to care for your mum during her time. I wish we have more people like you. I was moved by everything you said ! I have come to realise the importance of 'Love'. Saw you speak today at Nursing in Practice event in Birmingham. Over my years as a nurse I've seen many films, read many accounts and spoken to many people effected by dementia but never have I heard the journey portrayed with such love, reverence, passion and strength as yours was today. I was in tears, thank you for being such a wonderful career and son to your mom, Joan, and thank you for your thanks to the nurses, I think everyone there will strive everyday to be the nurse that you described. I bet Joan would be so proud of you, and rightly so. I attended your talk at NDDH last friday. what an inspiration you are to your mother, she was very lucky to have you looking after her, even if you at times felt lost. It makes me very sad that you did not have the support you needed but with the effort you are now putting in to help resolve this, hopefully you will help others have the support they require. I feel very proud to be embarking on my new career and can assure you I will try my up-most to fulfil my declaration I made after your talk. It was a privilege to hear you speak at UWS, Ayr on Friday. It takes a lot to be so honest and your love for your mum came through in every word you spoke. During my training and beyond I'll be aiming to do the small things that make the difference as you did with your mum. I think your story is inspirational not just in addressing how we deal with dementia but showing you, as a man, excelling in the role of caring and I hope your story will encourage other men who feel they can make a difference into nursing as a profession. I've lost two grandparents to dementia, your words struck a chord with me personally and professionally and I'll not forget them. Thanks for your bravery and determination in getting your message out there, it's appreciated and it will make a difference. I was fortunate to hear you speak in Rutland this week. You made me cry and laugh over your beautiful love story of your mum. She sounds as though she was a very special lady, and I hope that I will be able to give my mum as much love and care as she nears the end as you have to your mum. Thank you for reminding me why I do the job I do and for such an inspiring speech. I had the privilege to hear your presentation today at Dundee University and I must say it was the most powerful and inspirational presentation I have experienced so far in my nursing education. You are getting the message across in such a powerful and emotional way that really touched everyone in the lecture theatre. You are a wonderful person doing a wonderful thing in memory of your mum to ensure others don't feel quite so alone and forgotten. Thank you for allowing us to be part of the story. I had the privilege of hearing you tell your mum's story at my university literally hours ago and I am totally blown away by just how passionate you are. I have told 5 people about your speech already. I know dementia is common and as a student nurse I will most certainly come across patients with dementia however I never really gave it much thought. As with any illness or disease it was just in the back of my head as something I will learn about. However after today I absolutely cannot wait to work with patients with dementia and I just hope that I can make a difference to both the patients and family members I come in contact with. You passion oozed out of you and was contagious. Thank you for sharing your story. Thank you for being the voice. As a mum myself I know how proud I am of my children and I know your mum will be beaming with pride as you share your story. Thank you again.